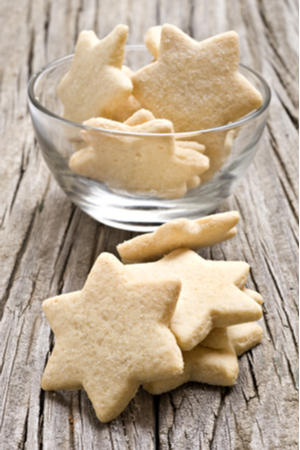 I can’t believe it has taken me so long to share this 3 Ingredient Shortbread Cookies recipe. It is one of my favorite recipes and it is so easy to make! Easy to make 3 Ingredient Shortbread Cookies. One of my friends suggested that we should have a cookie swap night. We would all gather together at someone’s house and make cookie trays from whatever cookies that have been brought. It is fantastic to make one cookie recipe and end up with several different varieties at the end of the evening. But even better, it is quality time spend with friends! So, of course, I jumped at the chance of participating. However, things are a little hectic right now. So I needed to find a quick and easy, yet delicious cookie recipe to bake. That is when I decided that I would make my 3 Ingredient Shortbread Cookies recipe! Seriously – only 3 ingredients and they come out fantastic. After removing the dough from the mixing bowl, work it until it forms into a ball. Butter, brown sugar and flour is all that you need to make these classic cookies. I knew I can handle that! The only problem was that I had used most of my butter sticks for our Thanksgiving recipes. I was already at the grocery store and I was trying to remember how much was needed to make this shortbread cookies recipe. So my first instinct was to hop on our website and check out the recipe. We have a several holiday recipes, including many Cookie Tray Recipes. After you roll out the dough use your favorite cookie cutters. But to much of my surprise, I had never shared our Shortbread Cookies recipe! So this week, I decided that since I was making such a staple Christmas cookie, I would finally share our recipe. 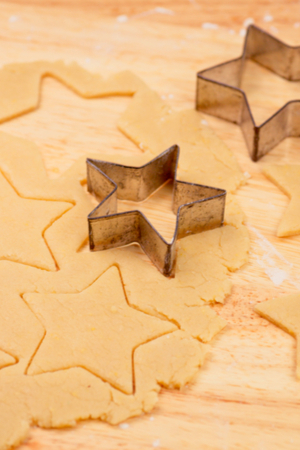 Do You Have To Use Cookie Cutters To Cut Out Shortbread Cookies? Although it is a traditional method to cut out the dough using cookie cutters, this definitely isn’t necessary. I have seen (and tasted) several shortbread cookies that are cut in simple rectangle shapes. So if you don’t have any cookie cutters on hand, or if you are pushing for faster and easier to way to make these delicious shortbread cookies, don’t worry! 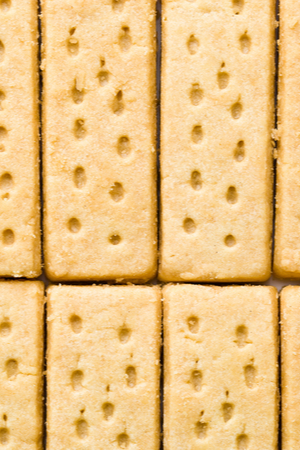 No cookie cutters required for these delicious rectangular shortbread cookies. Simply roll out the dough into a large rectangular shape. Use a sharp knife to cut the dough across the long edges, approximately 1 1/2 inches apart. Then cut across the smaller side, approximately every 2 inches so you end up with lots of rectangular cookies. Once baked and cooled, these cookies are perfect to dip in melted chocolate on one end for a beautiful (and easy to make) addition to any cookie tray! **Check out the recipe below and you can find a printable recipe card at the very bottom of this article. I always prefer to use parchment paper on my baking sheets for easy clean up! 1. In a large mixing bowl add butter and sugar and cream together. 2. Slowly add flour and mix just until incorporated. 3. On a lightly floured surface work the dough until it forms a ball. 4. 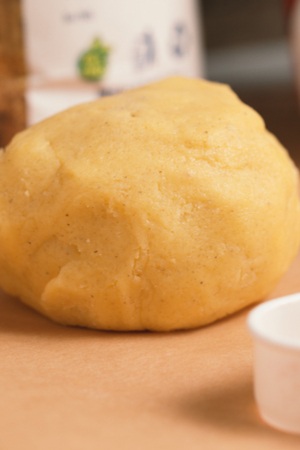 Roll out the dough to 1/2 – 1/3 inch thickness. 5. Using cooking cutters, cut into desired shapes. Or cut into small rectangular shapes. 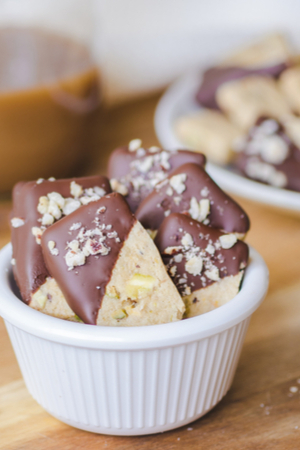 Rectangular shortbread cookies dipped in chocolate. 6. Place on ungreased cookie sheets and bake for approximately 10-12 minutes. *Optional – sprinkle the tops with sugar prior to baking. 7. Remove from oven and let cool on cookie sheets for 5 minutes. Using a spatula, place cookies on a cooling rack until completely cool. Hints- If the dough feels too sticky after adding in the flour, add additional flour as you work the dough into a ball. 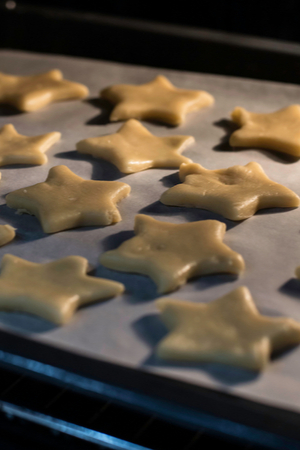 If you want sharp edges when you cut out your cookies, chill the cut out cookies before baking. In a large mixing bowl add butter and sugar and cream together. Slowly add flour and mix just until incorporated. On a lightly floured surface work the dough until it forms a ball. Roll out the dough to 1/2 - 1/3 inch thickness. Using cooking cutters, cut into desired shapes. Place on ungreased cookie sheets and bake for approximately 10-12 minutes. Remove from oven and let cool on cookie sheets for 5 minutes. Using a spatula, place cookies on a cooling rack until completely cool. If the dough feels too sticky, add a little more flour. ← Heading Home To The Farm! Retiring Early. Well, Actually…RELIVING! Can’t wait to try them tonight! Thanks for all of your recipes and posts–all the best to yout both with your new adventures awaiting! That is a great way to save time! You can definitely choose to use salted butter, and if there are no dietary concerns, this would definitely be a great choice. Hi Judy… you put the sugar and butter together in the mixing bowl and cream them together. There is no ingredient for cream, just a baking term. Sorry for the confusion. I make a similar recipe and roll the dough into a log. After refrigerating, just slice and bake! Probably best to use salted butter since there is no salt in the recipe , right ? Thank you am always looking for simple recipes to be able to share with my AHG girls. We do have baking days now and then for service projects. I’ve made the simple rectangular ones for years (2c flour, 1c sugar, 2 sticks butter) for years. When our brother-in-law declared they reminded him of his mother’s (from Australia), I knew I had them right. Hi Terry – I reloaded the recipe card so you should now be able to see it. Thanks for the heads up! What kind of flour….plain or self rising?